Usher’s step-son, Kile Glover, passed away over the weekend after being declared brain dead from a tragic jet-ski incident. Kile Glover was hit in the head by a passing jet ski while on inner tube on Lake Lanier in Atlanta. He was hospitalized and pronounced brain dead almost immediately. He was kept on life support for time being. On Saturday, Kile was taken off life support and passed away a short time after. The man driving the jet ski has been identified as 38-year-old Jeffrey S. Hubbard, a family friend. The police have determined at this time that no drugs were involved and no charges were filed against Hubbard. HHM.com WISHES USHER & HIS FAM THE BEST IN THIS VERY TOUGH TIME — TELL YOUR FAMILY YOU LOVE THEM EVERY DAY, BECAUSE YOU NEVER KNOW WHEN THE LAST TIME WILL BE !! R.I.P. KILE GLOVER !! 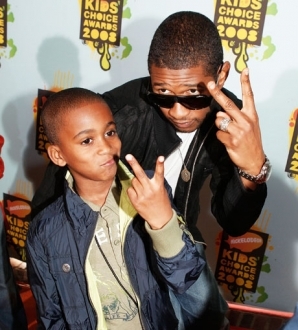 Usher’s eleven-year-old step-son has been declared brain dead, following a jet ski accident on Friday. Kyle Glover, who is the son of Usher’s ex-wife, Tameka Foster, has not experienced any brain activity since he was admitted to the hospital on Friday. Usher arrived at the hospital on the night of July 7th, while Tameka has not left since Friday. There has been no decision yet as to whether or not he should be taken off life support. Kyle was struck in the head by a passing jet ski while tubing on Lake Lanier in Atlanta, GA on Friday. PLEASE KEEP KYLE GLOVER, USHER & THEIR EXTENDED FAMILY IN YOUR PRAYERS — Appreciate Life To The Fullest because just like that, it can be taken from you………..